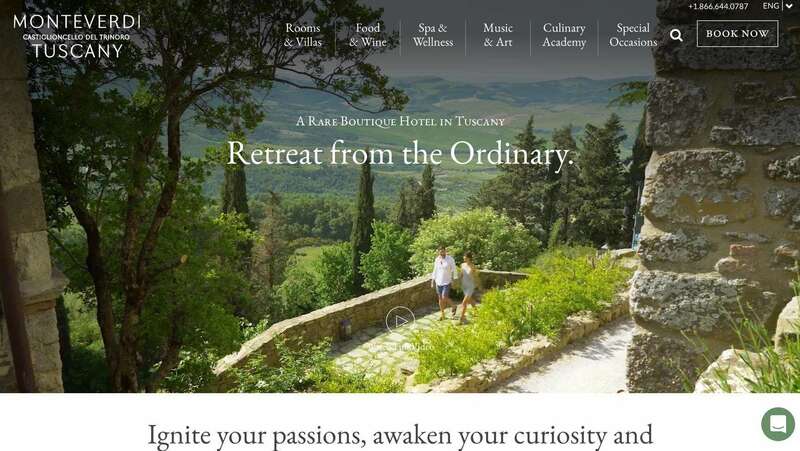 What a luxury it has been working with the Monteverdi Tuscany team on their digital marketing. We kicked off their website redesign with a homepage refresh and multiple landing page designs, including one specifically for Italian renowned fashion icon, Franca Coin. These new pages, coupled with digital advertising campaigns and some email marketing pieces have set the grounds for digital marketing success in the new year! Integrating and streamlining their sales tools, like their booking engine and CRM system, have also been beneficial to early successes for Monteverdi. Taking in the breath-taking photographs of the Tuscan landscapes and the quaint medieval village in Castiglioncello del Trinoro, Italy is one of the many perks of working on this project. New clean & sophisticated serif fonts and artisan/personalized handwritten fonts are used throughout the site providing a luxurious, Tuscan feel. Pristine photography captures the stunning views, architecture, and design while also highlighting the many features offered, including cuisine & wine, music & art, and of course the spa. Clearly displayed on a few of the landing pages are the unique features of Monteverdi Tuscany including Authentic Cuisine, Spa & Wellness, Arts & Humanities, and Luxurious Lodging.